The decision to start an bounce house rental business is a bold yet feasible one. Parents love to see their kids having fun, and renting a bounce house is one amazing way to get it done quickly and efficiently. Most events are in the evenings or on weekends, so this is the perfect part-time business that can easily be transferred into a full-time venture once a substantial following has been established. Let’s look at some tips to help you understand how to start a bounce house rental business. As a new business, it is a good idea to start with one inflatable. Additional models can be purchased later to provide a variety to your customers in addition to allowing you to service multiple customers at the same time. There are many inflatable manufacturing companies out there who can help you purchase your first unit. 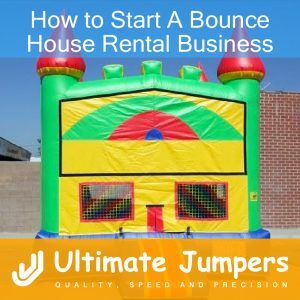 UltimateJumpers.com has years of professional experience catering to bounce house rental start-up businesses, helping them get started on the right foot. You will need a truck or trailer to transport the inflatable bounce house to any event. Each inflatable can weigh more than 100 lbs., so a dolly will also be useful to move the equipment around once it has been transported. The bounce houses will require an area where they can be stored. Obviously, the size of the space will depend on the number of bounce houses you own. The storage space should keep the equipment dry, clean, and away from critters/animals. When you start a bounce house rental business, you will need to decide on the type of business plan that will work for you. Unlike as ole proprietorship or a partnership, a corporation or limited liability company will afford protection from claims in case there is an injury. Check with the Secretary of State for registration requirements in your specific state. In general, an occupational license is required for this type of business. The requirements vary by state and local area. In addition, some states consider a bounce house rental business a type of amusement park, which means additional paperwork will need to be filed. It is important to purchase liability insurance that will cover accidents and injuries on/in the inflatable. General business insurance may cover damage to the equipment. Consult an insurance agent to determine the type of coverage you will need, especially if you are in a state that classifies this business as a type of amusement park. Draft a rental agreement for your customers. You may want to review some key points with an attorney. For example, the customer needs to understand the proper use of the inflatable and agree not to point fingers at the company in the event of accidents/injuries. Once you start a bounce house rental business, it is time to advertise your business. Pass out flyers and business cards. Advertise your services through social media. Place ads in newspapers and local magazines. Make sure to focus on social media marketing as well. For example, in instagram you can share photos of kids having fun on your bounce house. Pass out business cards and promotional coupons during events where you will meet potential customers.